I am wild about Paul M. Wild. It easily makes my Top Ten favorites for both beauty and ease to grow. This peony was introduced by Gilbert H. Wild and Son, Missouri breeders, some 50 years ago, but incredibly has never managed to win the American Peony Society's Gold Medal Award or taken the APS Best of Show honors. The peony features full double flowers of a rich ruby red. It has exceptional size and vigor. The stems are very stout. Even so, the prolific and large blooms can make the stems bow unless supported. If sidebuds are removed, stems stand well on their own and the center bloom can become massive. Most of the descriptions of this peony put its height at 36-inches, but I find that it regularly grows to 40 inches or more here in Northwest Wisconsin. In fact, we've had plants exceed 60-inches some years. It was amazing to see these big 10-inch blooms practically staring you in the face. The plant is very disease resistant—unlike many other red cultivars. After its mid-to-late season bloom, the dark green foliage remains attractive throughout the rest of the growing season, which really adds to its value in the garden. 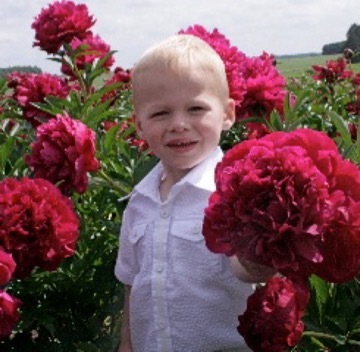 The only thing I find fault with in this peony is—like many other reds—its lack of a significant peony fragrance. But its other exceptional qualities more than make up for this. If you have a place for a red peony in your garden, try Paul M. Wild. I can almost guarantee you'll be wild about it, too.